I’d like to start by thanking all the guest speakers who contributed to our Spring programme, held at the Adult Education Centre. In March, we enjoyed a general knowledge quiz which was ably hosted by Kathleen O’Brien. The following week, Majella O’Sullivan (Auctioneer and Estate Agent) advised us on how best to buy, sell or rent a house. A busy question and answer session followed. A week later, Annie Kelleher (Chiropodist/Podiatrist) gave a talk and demo (thanks, Judy) on foot care. As always, Annie was a tonic to listen to and it proved to be a truly relaxing morning. Towards the end of March, we headed (by coach) to Allihies Copper Mine Museum for an educational talk on the workings of the mines in times past. We were delighted to welcome four ladies from the Active Retirement Group who joined us for this outing. While it was a bitterly cold day, we got to savour the Beara peninsula at it’s best with blue skies and sunshine all the way. Having traversed the Healy Pass, we stopped off in Castletownbere for a morning cuppa before travelling on to Allihies for the museum visit. Afterwards, we repaired to O’Neill’s Bar for a delicious hot lunch beside a welcome open fire. The final day of the Spring programme was devoted to our AGM. At the meeting, tribute was paid to Mary Ellen Spillane and Judy O’Connor who are stepping down from the committee having given great service. We presently have only 5 committee members going forward so if you’re a KWG member, please, please… consider volunteering for the committee. YOUR HELP IS NEEDED! The AGM was rounded off with an impromptu lunch in Davitt’s. While our official programme has come to an end for the summer, we continue to meet weekly at the Brook Lane Hotel (Wednesdays 11am-1pm) for tea/coffee and chat. If you’re new to the area, or would like to meet with other women, please feel free to drop in and join us sometime. I can be contacted at 083 191 6800 for more details. Stephanie Blandford (Chairperson). 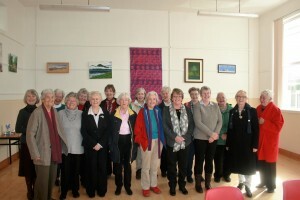 The Kenmare Women’s Group(KWG) is a group of (mostly retired) women who meet weekly (September to March) at the Adult Education Centre, to enjoy a varied programme of speakers and activities. During the summer months, members meet weekly in a local hotel, on an informal basis. Newcomers are always welcome.